The Tesla Roadster has generated far more conversations than sales, but Tesla hopes to sell far more of the upcoming Model S sedan. 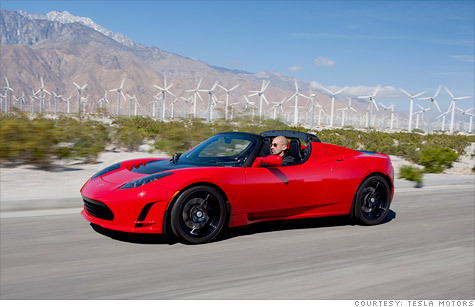 NEW YORK (CNNMoney) -- The road is coming to an end for the Tesla Roadster. Automaker Tesla Motors (TSLA) will stop taking orders for the car in the U.S. in about two months as the carmaker focuses on its Model S electric sedan. Priced around $109,000 dollars, the two seat Tesla Roadster sports car was never intended to be a huge seller. Tesla reported sales of 1,650 Roadsters worldwide by the end of April, 2011. The car is sold in North America, Europe and Asia. With its performance and relatively long driving range, the Tesla Roadster helped change the perception of electric cars from being little more than golf carts with doors to actual viable production vehicles. The Roadster can go from zero to sixty miles per hours in under four seconds, according to Tesla, and can travel about 250 miles on a charge. Tesla's next big thing: Tesla's roadster production is coming to halt as the maker of battery-powered cars switches its focus to the upcoming Model S electric sedan. The first sales of the Model S sedan are expected to begin around the middle of 2012. At a starting price of about $58,000, the base model will have a driving range of 160 miles, Tesla said, but buyers will be able to pay more for versions with larger battery packs and longer driving ranges. The first ones sold will have an estimated driving range of 300 miles with a price tag closer to $80,000. Model S will be able to seat up seven people when equipped with an optional third row of rear-facing seats. Tesla hopes to be able to sell as many as 20,000 of the cars by 2013. Besides building its own cars, Tesla has a business partnership with Toyota Motor Co (TM). to produce a plug-in electric version of the Rav4 SUV and a deal with Daimler (DDAIF) to provide batteries for an electric version of the Smart ForTwo minicar. The Model S sedan will be built in a California factory that was once used jointly by Toyota and GM.